Friday, September 9, 6 - 8 pm. The Marsha Mateyka Gallery opens its fall season with an exhibition of new photographs by Susan Eder and Craig Dennis. Entitled "Nothing Lasts Forever", these collaborative works represent the gallery's second solo exhibition for this husband/wife team. Since 2001, Susan Eder and Craig Dennis have collaborated in photographing unusual aspects of common subjects. "By recording what is available to the attentive eye, our work expands upon the viewer's own everyday experience. We do not alter subject matter, keeping our images as true to reality as possible." The current exhibition presents two new series of work. In one, cloud images are used. In "Vision Test", a work based on the eye chart used by optometrists, it becomes evident that Susan Eder and Craig Dennis have created an alphabet from cloud shapes. They call their alphabet "New Cloud Roman". 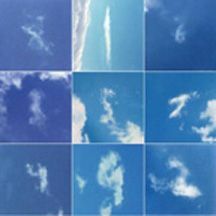 Many of these letters are based on restored snapshots of clouds originally taken by Susan Eder in the 1970s. In these new works, text messages are spelled out and arranged in sequences. In the artists own words, these new pieces "illustrate the universal human tendency to perceive meaning in abstract shapes, and reflect our interests in the overlap between text and image." In the second series, images of bread are used. Newton may have used the apple to illustrate gravity. Susan Eder and Craig Dennis use backlit slices of cinnamon swirl bread to illustrate the complex second law of thermodynamics - the concept of entropy ( the increasingly disorganized fate of all things ). In the photograph " Entropy in Cinnamon Swirl ( Chaos, Simplicity )", thirty-six slices of bread are arranged in a grid from simple and ordered at the top left, to complex and disordered at the bottom right. Another group of bread images is entitled "Latent". This term in photography refers to the image exposed on paper before it is developed, while still in a hidden state. In discussing their technique, these artists have said "Our work method currently combines traditional camera-based photography with digital output. We shoot with a Nikon 35mm camera, then scan the developed slides or prints at very high resolution. The resulting files...are then output as LightJet prints, whereby the image is laser-projected onto archival metallic or polyester-based photosensitive paper." For further information, please contact the gallery, 202 328-0088 or visit our website, www.marshamateykagallery.com.